Pink Lizard Promotions. Buy Local with Promotional Merchandise – Choose British Made! It is evident that in the last few years there has been a real push towards buying local and using British made products. Here at Pink Lizard Promotions, we supply a huge range of products which are 100% British made. So, you can keep your company’s ethos bang on trend by using high-quality branded products which are easily sourced and offer fast lead times. Thermal Mugs: Did you know that the extremely popular Americano Thermal Mug is actually made in Britain? This fantastic travel mug has a durable double-walled design and a huge range of colour options - including two brand new colours with the stunning Americano Midnight mugs. Americanos feature a large branding area to the mug, for print in up to six spot colours. You can also choose to include a branded silicone grip and different lid options too. The mugs are top-rack dishwasher safe, microwave safe and BPA free with a 350ml capacity – what more could you want? From £2.67 a unit – enquire now. Promotional Packs: Or why not take it one step further and choose a 100% British made promotional pack? This pack offers absolutely unbeatable value – brilliant for smaller budgets. 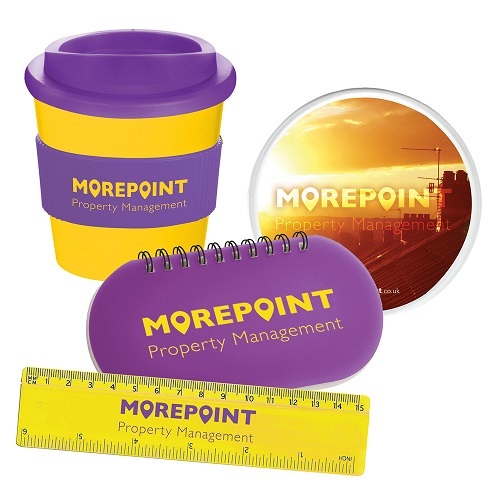 The pack includes the Americano Thermal Mug as well as a ruler, notebook and coaster. With this great selection, your brand is set to remain a prominent feature on prospective client’s desks for months to come. From £2.92 a unit – enquire now. Keyrings and Magnets: Another great way to get your brand out there is with another UK manufactured promotional product – choose a custom shaped key fob or magnet to offer a fun and quirky reminder of your business details to your customers. Brightly coloured and available in a range of three standard sizes, keyrings and magnets are brilliant and inexpensive giveaways for shows and events and are especially popular in the tourism and leisure industry where your promotional item becomes a special memento of your customers’ experience with you. Don’t forget that branded magnets and keyrings are also brilliant items for mail outs – did you know that a lumpy mail campaign can get you a response rate of 50% - which creates unbeatable ROI for your business. From £0.40 a unit – enquire now. Glassware: If you’re in the events and corporate industry, then British made branded glassware is an absolute must. The range is stunning – crystal cut wine glasses, engraved brandy and gin glasses and delicate carafes mean that there is always an item to suit your needs whilst sophisticatedly showing your brand in its best light. What’s more, there is a product to suit all budgets and you can trust you’ll be receiving excellent quality too! From £3.50 a unit – enquire now. Confectionery and Cupcakes: A brilliant giveaway at events, did you know that you can get a massive range of cakes, chocolates and sweets which are baked, made, decorated and packed in the UK? This means shorter lead times and quality assurance – who can say no to a tempting treat after all? From £0.50 a unit – enquire now. Umbrellas: Yes, that’s right – we have dozens of British made umbrellas to choose from which feature a host of branding options and special features. Choose from vented, telescopic, wooden handles and a range of print areas and colours. Perfect for events and gold days, umbrellas are a great way to show of your brand in style. From £4.59 a unit – enquire now. Of course, this is just the tip of the proverbial iceberg when it comes to British made promotional products but make sure, when you are looking at your next event or campaign, you check out British made products – you’ll be amazed at what’s available! View more UK manufactured products here.